It has been noted that in the Americas racial identification and genomic racial ancestry frequently don’t well correspond. In Latin America, the association seems to be modest on the individual level. For example, Ruiz-Linares et al. 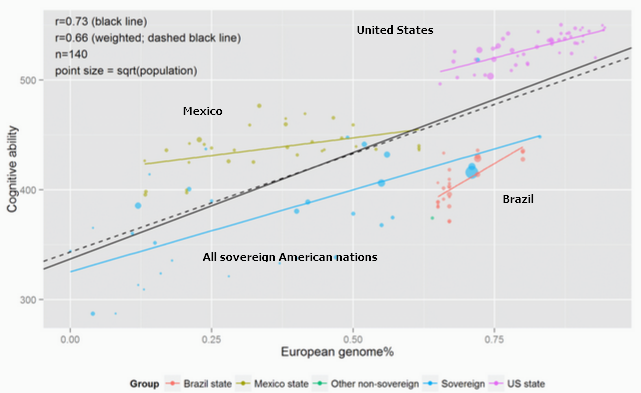 (2014) found a correlation of 0.48 between self-identified European and Amerindian racial identity and genomic ancestry in a five country sample. In principle, the same could hold on the aggregate national level. And in some instances there’s a clear discordance. While the Argentinean and Brazilian national populations have roughly the same degree of pre-1500 European ancestry, Argentine has a White European national image while Brazil has a multiracial one. One might wonder, then, to what extent average racial self-identification concords with average racial admixture on the national level. This is an interesting question and others in a similar vein can be asked. For example: To what degree are differences in national racial identification related to such and such outcomes independent of genomic ancestry? Perhaps, for example, members of countries with a more European identity act in aggregate different than ones that have developed, net of genotype, a less European one — an acting White effect on the national level. Ruiz-Linares et al. (2014) found that, on the individual level, White identity was associated with wealth (but not educational attainment) net of European ancestry (see note 1). If such a pattern can exist on the level of the individual, it could so on the level of the nation. Here, the first matter will be explored. I first present several indexes of national ancestry for the Americans; these include: national genomic percents, aggregate self- identified race percents, Putterman’s ancestry percents, and national skin reflectance scores. For comparability, these values are expressed in terms of major racial categories e.g., White European, Black African, and Amerindian — plus an “Other” group. I then use correlation analysis to validate these estimates. Previously, a literature review was conducted regarding continental racial admixture and educational attainment and/or socioeconomic status. 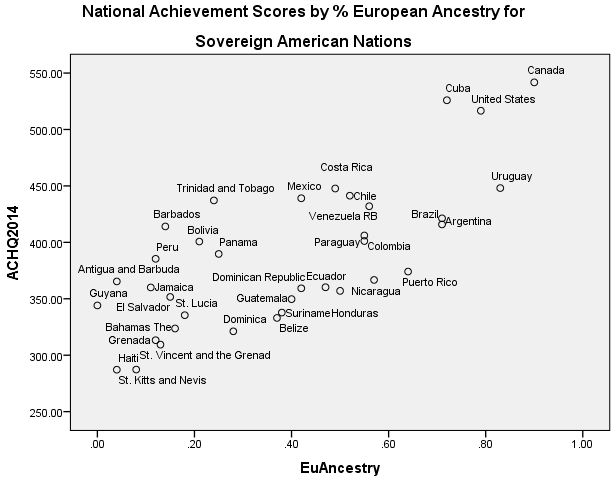 Across the Americas, Amerindian and African (versus European) ancestry was found to be negatively correlated in admixed populations (e.g., Hispanic Americans) with income, educational attainment, occupational rank, and other cognitively correlated indexes of socioeconomic status. Multiple possible explanations were discussed. Some of these predict that the ancestry-outcome association will generalize spatially, such that admixture will be correlated with outcomes across regions and nations. This need not be the case and is not directly predicted by other accounts of the individual level admixture-outcome associations, such as phenotypic based discrimination ones, which work on the individual-level. The association between regional ancestral and cognitive related outcome variation in Mexico will first be explored, since for this county reliable regional admixture estimates, at least with regards to European and Amerindian ancestry, and outcome measures are available and also since there is a good deal of spatial variation in admixture (and outcomes). Subsequently, the analysis will be generalized to the whole of the Americas. The Figure 1 below depicts the Mexican spatial ancestral racial variation. Method: Admixture estimates: Admixture estimates were taken from Salzano and Sans (2014) and Moreno-Estrada et al. (2014). For the two sources, Pearson correlation was 0.94 for European admixture, -0.60 for African Admixture, and 0.94 for Amerindian admixture. Regarding European and Amerindian admixture, the estimates exhibited a high reliability, thus justifying their combination. The African Admixture estimates were unreliable due to the noisiness of the measures in conjunction with the limited range and variance in admixture. Admixture estimates were averaged for each district. Missing district data was then estimated based on the measured admixture of adjacent regions. This produced four different admixture estimates: (a) Salzano and Sans (2014), (b) Moreno-Estrada et al. (2014), (c) the average of (a) and (b), and (d) estimates based on (c) taking into account regional proximity. Descriptives are presented in Table 1. 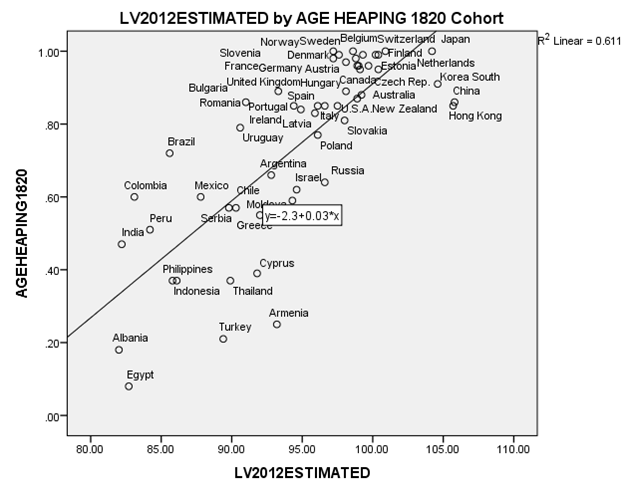 Cognitive Ability estimates: 2003, 2006, 2009, and 2012 average math and reading PISA scores were computed for each district. Regional scores were highly correlated across years, thus justifying the use of cross year average scores; deviation scores relative to the Mexican national mean were computed and averaged across years. 2002 and 2005 average district level Raven’s Matrices scores were also computed. Human Development Index: 2010 and 2012 Human Development Index scores highly correlated across year. And average scores was computed. The excel data file is attached. Discussion: Regional Amerindian Admixture was a robust predictor of regional outcome differences. The Amerindian ancestry -outcome association found based on admixture mapping generalizes spatially, at least in Mexico. These findings are as would be predicted by an evolutionary genetic explanation. Variations of shared environmental — “cultural” — accounts are possible insofar as shared environment can be genealogically sticky. Is there no population genetic 'support' for a racial hereditarian hypothesis? Over the last decade, scores of large scale admixture-mapping studies have been conducted largely in an attempt to elucidate the origin of ethnic disparities in disease rates and medical outcomes. 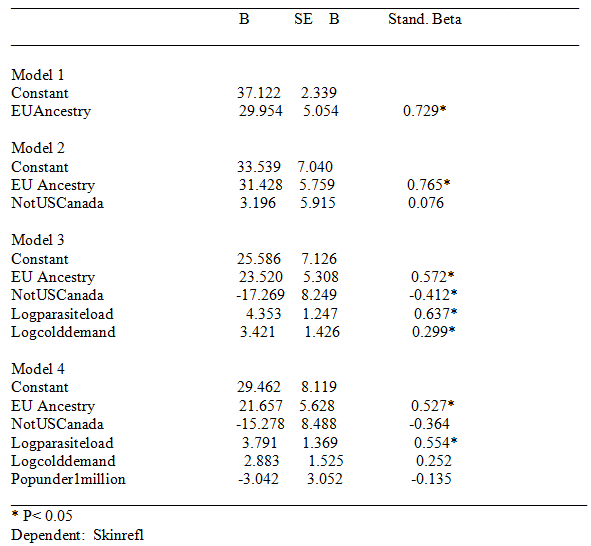 In the simplest type of such studies, researchers determine if there is a robust association between genotypically defined continental racial ancestry (typically: African, European, and Amerindian) and relevant outcomes in admixed populations. To control for potential confounding effects, measures of educational attainment and other indexes of SES are often included in the analyses. These variables are often treated as environmental indicators, which is odd, since within populations they are found to be under non-trivial genetic influence. For example, based on a recent international meta-analysis of biometric studies involving 51,545 kinship pairs, Branigan, et al. (2013) found that educational attainment had a kinship-based heritability of 0.40, meaning that genes explained 40% of inter-individual educational differences; based on a sample involving 7,959 individuals, Rietveld et al. 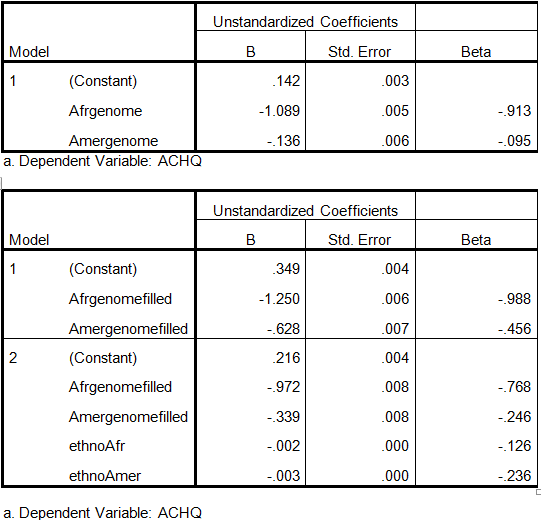 (2013, table S12) found a GCTA-based heritability, one which takes into account only the effects of population-wide common genetic variants, of 0.22. These results were replicated by Marioni, et al. 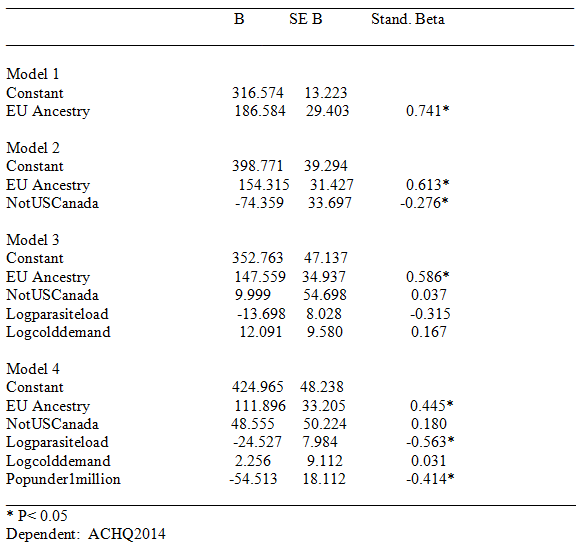 (2014, table 3), who found a kinship-based heritability of 0.40 and a GCTA-based one of 0.21. When genes explain some of the variance in a trait within groups, they plausibly explain an indefinite portion of the variance between groups. Curious it is, then, that these external outcomes are often assumed to represent environmental influences between groups.